How do you get the chance to name a new element? First things first, you’ve got to make a new element. This will mean creating an element with over 100 protons in its nucleus, known as a superheavy element. The majority of the periodic table contains elements found naturally on Earth – up to around atomic number 92, with a few exceptions. So, since the 1930s, scientists have tried to synthesise new ones via nuclear fusion. Teams accelerate light nuclei – calcium-48 is a particular favourite – in a cyclotron, before firing the projectile at a target, such as bismuth. If they’re lucky a new superheavy element is made – albeit one that’s in existence for a matter of seconds. The most recent superheavyweights to be created are elements 113, 115, 117 and 118. But it’s an arduous process. In the case of element 113, now named nihonium in honour of Japan, it took the team at Riken eight years to get enough evidence to prove it existed. 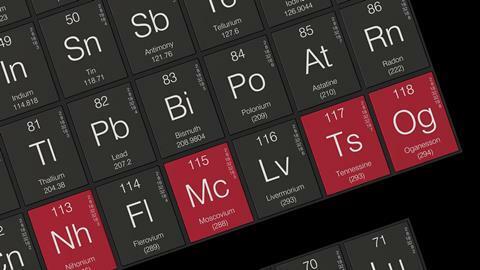 Elements 115, named moscovium – after the region that the Russian Joint Institute for Nuclear Research is situated – and element 117, tennessine (Ts) – named in honour of the US state of Tennessee where Oak Ridge National Laboratory can be found – also took a long time to produce. But not as long as oganesson (Og), element 118. Scientists at Lawrence Berkeley National Laboratory, US, first claimed to have discovered oganesson – named in honour of nuclear physicist Yuri Oganessian – back in 1999. The result was retracted only two years later, however, as the lab couldn’t reproduce it. 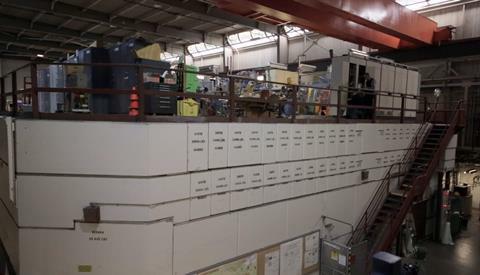 By 2006, a joint effort between the Joint Institute for Nuclear Research in Russia and the Lawrence Livermore National Lab, US, unearthed the elusive element. All four elements were formally recognised in January 2016. Once a group has found a new element, they submit their findings to the International Union of Pure and Applied Chemistry (Iupac). This is the organisation responsible for standardising weights, measures, element names and symbols. After Iupac verify the result, only then are the superheavyweight hunters invited to suggest a name and symbol for their newly-discovered element. What if two groups discover the same element – who names it then? In recent years, research groups have often worked together to produce a new element, as is the case for moscovium, tennessine and oganesson. When there is a joint discovery, Iupac invites the groups to agree on a suggested name and symbol. If they cannot come up with a name within six months, however, Iupac’s inorganic chemistry division will pick one for them. But it hasn’t always been plain sailing. In the 1960s, Iupac got caught up in the transfermium wars. At the height of the cold war, the Lawrence Berkeley Laboratory, US, and the Joint Institute of Nuclear Research in Russia tussled over who discovered elements 104, 105 and 106 and who should name them. Back in 1947, Iupac had introduced a set of recommendations to stop such a conflict arising. The organisation declared that if a discovery was proven, the discoverers did not have the sole right to name it, they could only put forward a suggestion – Iupac would have the final say. But it didn’t work. The US declared element 104 would be called rutherfordium and Russia argued it should be named kurchatovium. The situation got so bad that both names ended up being used colloquially in different parts of the world. Over 30 years later, Iupac finally stepped in, offering a compromise to both parties. Element 104 was given the name rutherfordium. Iupac believed Russia’s suggestion was unsuitable given it was named after Igor Kurchatov, the ‘father of the Soviet atomic bomb’, and was perhaps put forward simply to stoke US anger. But Russia was allowed to name element 105 dubnium, dedicated to the Russian town famed for its superheavy element research. The US would also get bragging rights for element 106, which was eventually named seaborgium. In 2002, Iupac reaffirmed the 1947 recommendations. They also added a detailed list of rules for naming an element. Can you name a new element after anything? No. Even back in the 1700s, chemists recognised the need for a standardised naming system. By 1919, Iupac was founded to try to bring some rigour to the naming of elements. When a research group suggests a name to Iupac, it has to fall into one of five categories. New elements must be named after a mythological concept or character (including an astronomical body), a mineral, a place or geographical region, an elemental property or a scientist. In 2002, Iupac recommended that any new metallic element must end with the suffix ‘ium’ – think chromium or titanium. But the organisation wasn’t prepared for research groups discovering elements beyond group 16 in the periodic table. Iupac revised this guideline in 2015, stating new elements in groups 17 should end in ‘ine’ – as fluorine and chlorine do – and ‘on’ for group 18 elements – as in neon and argon. Even though the rules appear quite restrictive, that hasn’t stopped researchers having fun when naming a new element. Cobalt is famously derived from the German word for a mischievous goblin or kobold – a term used by miners who tried to refine the fickle cobalt ore. But there are other signs of mischief on the table. It is rumoured the eminent physicist Glenn Seaborg pulled a prank when coming up with the symbol for plutonium. The most obvious choice was ‘Pl’, but Seaborg went with ‘Pu’ for no other reason than the symbol sounding like the noise a child makes when sniffing a smelly object. What do you call an element without a name? Each new element is assigned an interim name while Iupac weighs up the suggested name and symbol. The element may be referred to by either its atomic number, such as ‘element 118’, or Iupac’s systematic name. In this case, the name is derived from the element’s atomic number, although confusingly draws on both Greek and Latin numerical roots (one=un, two=bi, three=tri and so on). So, moscovium’s systematic name was ununpentium and tennessine’s was ununseptium. Although the systematic name will be placed on the periodic table, many scientists simply refer to it by its atomic number. You’ve suggested a name – now what? Once a discovery has been verified, the discoverers are invited to submit a name and symbol to Iupac’s inorganic chemistry division. The inorganic division will then compile a draft recommendation and send this to the secretary of the catchily named inter-divisional committee on terminology, nomenclature and symbols (ICTNS). This report is then sent out to 15 independent experts, as well as other members of the ICTNS. The panel judge the suggested name and symbol, before releasing them to the public for a five month consultation process. Aside from the naming categories, the judging panel will also check the suggested name and symbol fulfil other suitability criteria. The most obvious one is to check the element name and symbol are not already in use. But there is another artefact from the transfermium wars in the ICTNS’ suitability checks. If a suggested name has been used in literature or is in common usage, but Iupac ratify a different name, the original cannot be used again – even for a different element. Iupac state this is to avoid confusion in the literature. This was the case for element 105. As the transferium war was raging, the US suggested the name hahnium – a tribute to the radiochemist Otto Hahn. But Iupac ratified the name dubnium. This means the name hahnium cannot be used for a newly discovered element and Hahn’s tribute is lost to history. Once the judging process is all wrapped up, the inorganic chemistry division’s president sends the final recommendation to the Iupac council. If all is well, the council will approve the name and symbol, publishing both in Iupac’s house journal Pure and Applied Chemistry. The whole process can take anywhere up to a few years, but, under the new guidelines, Iupac will be hoping to avoid another transfermium-style saga. chemistry is so amazing, you will know about experiments, theories, adventures, and about the periodic table/ elements.....since I heard about it I never stop researching cause I'm curious and interested.